Wayne Rooney was stopped on a shootout attempt in his MLS playoff debut, Nick DeLeon skied D.C. United's final kick over the crossbar and the Columbus Crew beat D.C. United 3-2 on penalty kicks after they tied 2-2. 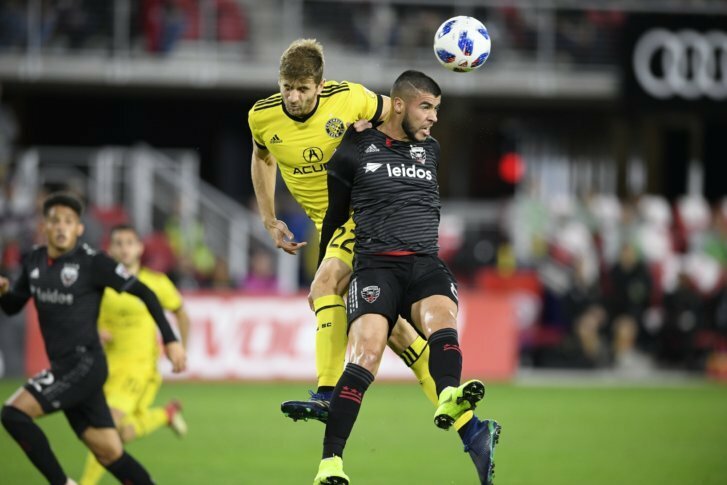 WASHINGTON (AP) — Wayne Rooney was stopped on a shootout attempt in his MLS playoff debut, Nick DeLeon skied D.C. United’s final kick over the crossbar and the Columbus Crew beat D.C. United 3-2 on penalty kicks after they tied 2-2 on Thursday night. Columbus goalkeeper Zack Steffen denied United’s top two scorers in Rooney and Luciano Acosta. Patrick Mullins, who was traded to Columbus from D.C. earlier this year, had a chance to win it, but his penalty shot hit the crossbar and DeLeon wasn’t close on the final attempt. Federico Higuain, Wil Trapp and Niko Hansen converted in the shootout for Columbus. The Crew won a penalty kick shootout on the road in the knockout round for the second straight season. Higuain scored Columbus’ second latest goal in club history in the 96th minute by heading in Harrison Afful’s cross. But DeLeon, a second-half sub, tied it at 2 in the first minute of the second extra 15-minute session in front of a sellout crowd of 20,600. Frederic Brillant opened the scoring in the 21st minute for D.C. United by heading home a rebound for his first goal of the season. Higuain tied it nine minutes later by sending home a loose ball in front of the net.